5 months ago I bought a 2016 R1200GS Triple Black (my dream bike). I did order a set of engine covers from you guys after seeing the YouTube video. I had the dealer (JCWilson BMW Motorrad, Murieta CA) order a set. This was the first time that they’ve seen your product, and they were impressed with the quality of it all. Fast forward 5 months: Two weeks ago going up Highway 74 from Palm Desert and doing 52mph I got myself in the middle of something very slippery on a long right turn. The bike got away from under me, and I was very lucky that no cars were coming down. The bike traveled close to 200 feet, and hit the right side gardrail. 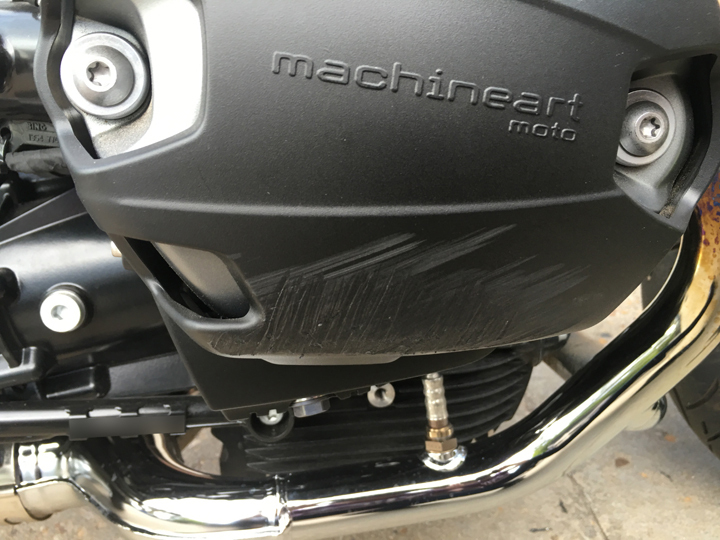 No oil was spilling from the right engine cover due to the amazing MachineartMoto engine cover. Wow!!! Those things are amazing! The dealer was amazed how well your prouduct did. My GS was a total, due to the the front end being destroyed – Sad day for me. I suffered a broken wrist and black and blues on my right leg (gear gear gear). I’m getting a R1200R next month and I’ll be ordering a new set for sure. 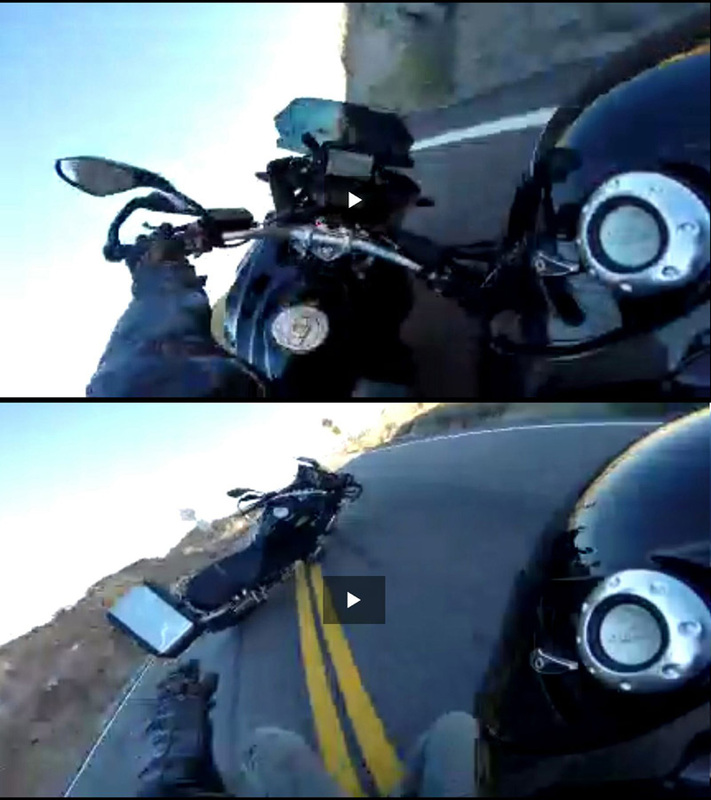 I’m sending you photos of the video sequence caught on my GoPro, and the side engine cover. Simply Amazing! 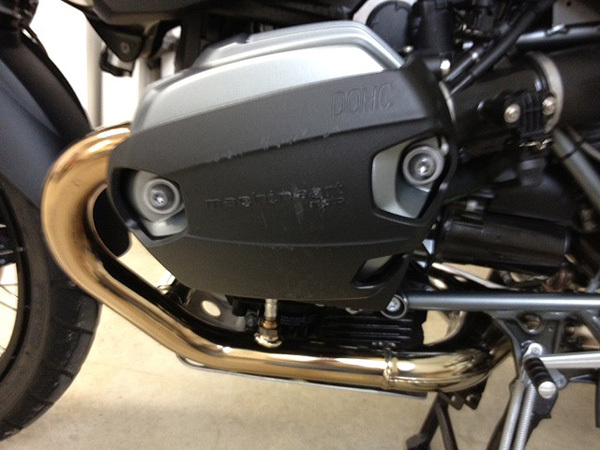 I purchased a set of your valve cover guards for my 2014 BMW R1200RT, last December. I am sending you this email to say that they work. On May 16th, 2015 I had an accident while entering a gas station at 10 pm that evening. I hit a concrete curb that I couldn’t see because of the darkness. It wasn’t painted yellow. I hit the curb by the entrance and it put the RT on it’s right side fast and hard. The RT slid approximately 25 feet on it’s right side into the gas station. I suffered a sprained ankle and some scrapes and bruises. The valve cover guard held up and kept the valve cover from being damaged. The RT has been repaired and has a new set of your valve cover guards on it. A picture of the scraped up guard is attached. Thanks for making a product that works! X-Heads. Do you feel this will prevent a cracked valve cover in a parking lot tip over? Or is it more designed to stop rash on the aluminum? 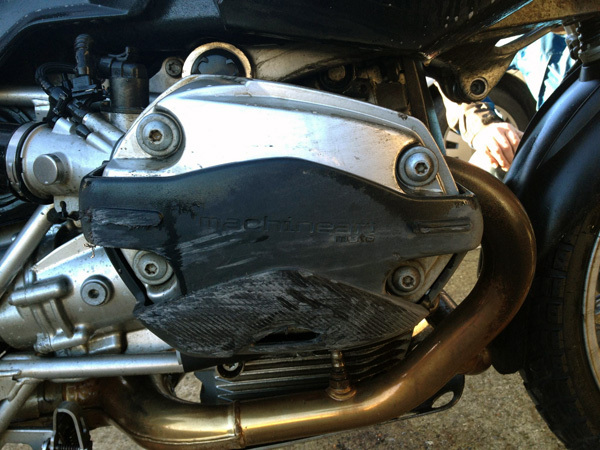 I’ve attached some images below showing how the X-Heads survived, from a driveway drop to racing on an HP2. Through several years of testing and making mistakes, we now use a SuperToughTechnology Dupont Nylon that has a no break rating and is high heat and UV stabilized. Our first products did crack but the newest generation of products do not. They are slightly ductile enabling the material to move in the process of absorbing the force of impact and prevent cracking. Behind the outer shell is a thick thermoplastic rubber liner that rests against the valve cover, contributing to the dissipation of impact force. 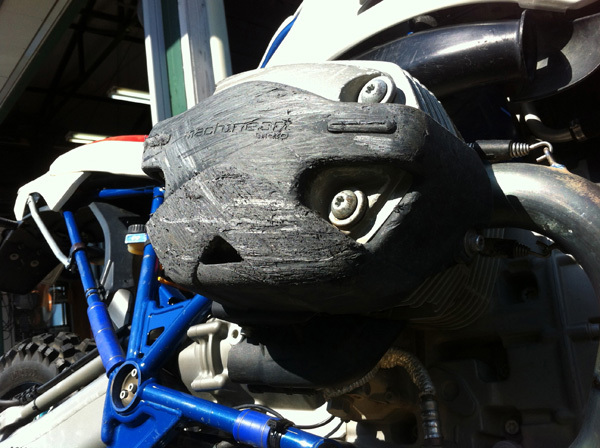 The shot of the X-Head DOHC shows the effect in a driveway drop. 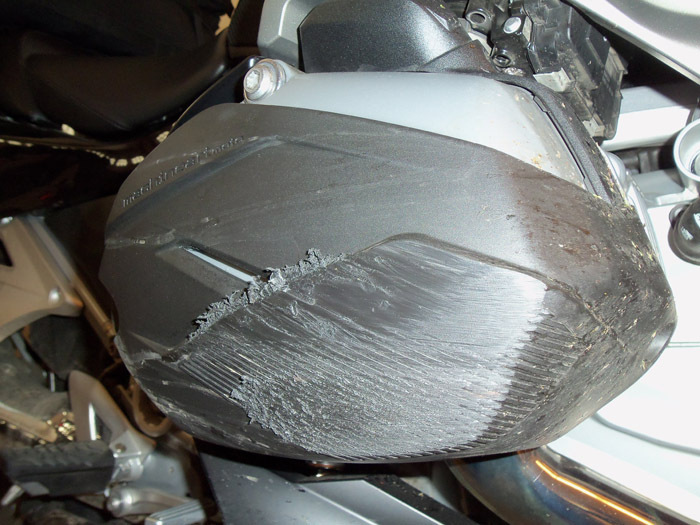 They are designed to cover 80% of the face of the head to protect, not only the bottom/front initial impact area in a drop, but also the upper part of the cylinder head. Even in a stationary drop in a driveway, inertia can cause a bike to roll partially onto the face of the head before it settles down. 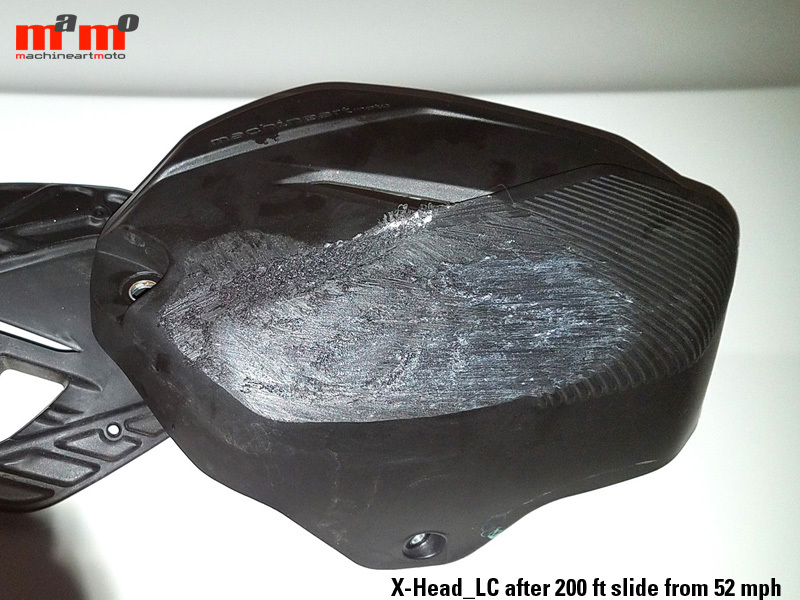 In a more severe test of endurance, you can see that the surface of the X-Head on the HP2 is well worn from multiple drops but it remained intact saving the head cover.